This week, we’re exploring how data technologies are changing the recycling and waste management landscape. 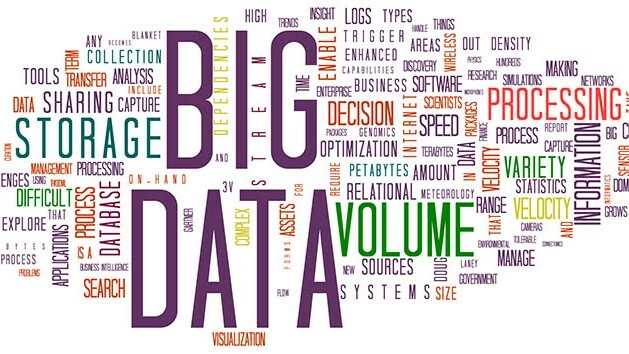 In a world where connectivity is fast-growing and technology is everywhere, ‘big data’ is becoming a central element to advance outreach and education strategies and improve the performance of recycling schemes. 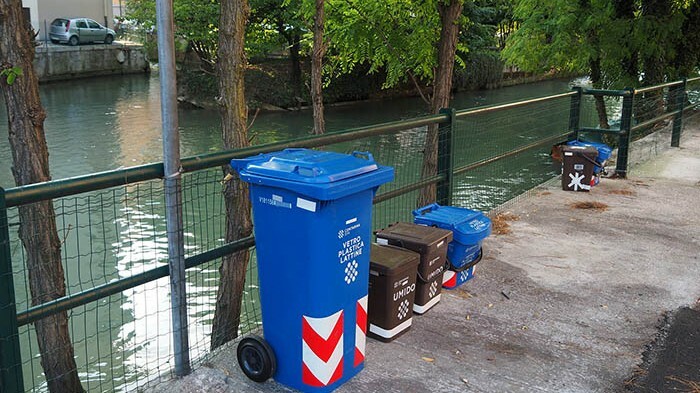 We speak to Marco Mattiello of Italian waste management company Contarina, to understand how the integration of an RFID tracking system into their recycling program has increased efficiency and improved engagement – and to get a glimpse into what the future may hold for big data technologies in their system. You can download the Zero Waste Europe Case Study on Contarina here. In part two, we brief you on the Zero Waste Europe Workshop on Best Zero Waste Practices in the US and EU, and the European Circular Economy Conference that both took place in Brussels recently, in response to the recent withdrawal of the waste policy package by the new European Commission. 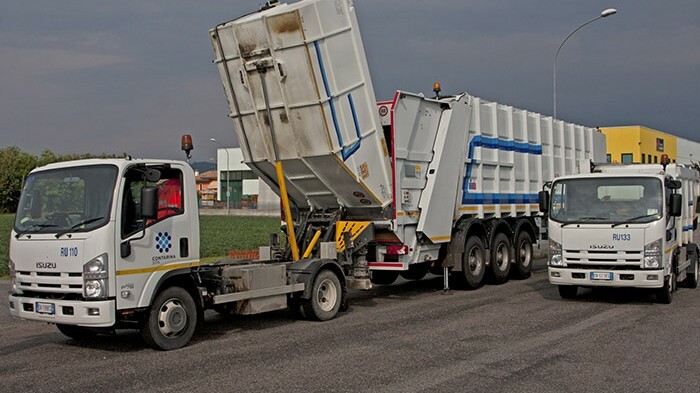 Sartori Ambiente supplies systems and containers for effective waste segregation and management, paying attention to how waste is collected, and the needs of householders, to deliver the most practical and convenient solutions. Constantly committed to researching and developing new systems, Sartori Ambiente can turn the most ambitious projects into a reality. For more, visit their website. Workshop: the Best Zero Waste Practices in the US and the EU. March 4th 2015, Brussels, Belgium. Organised by Zero Waste Europe. The newly elected European Commission has expressed the intention to withdraw a waste package which was presented in 2014 after years of work by the previous Commission, Parliament and Council. This move has been justified by the intention to retable a more ambitious circular economy proposal. The aim of this workshop is to provide proof of the economic, social and environmental benefits of having an ambitious waste policy. International Composting Awareness Week Australia (ICAW). May 4th – 10th 2015, Australia. Organised by CORE. Celebrated in Australia, Canada, the UK and the USA, ICAW is a week of activities, events and publicity designed to improve awareness of the importance of compost and to promote compost use, knowledge and products. We can compost to help scrap carbon pollution by avoiding landfilling organic materials and helping to build healthier soils. Feature Image by Maldive. Some rights reserved. 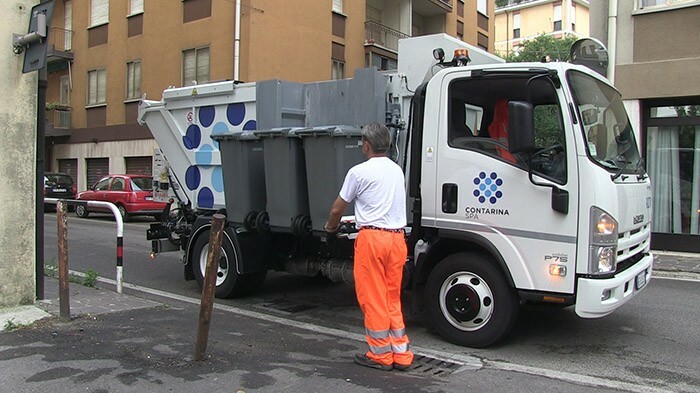 Q: Contarina has one of the most successful recycling systems in Europe and the world – with a recycling rate of up to 85% and only fifty-three kilograms of residual waste per inhabitant per year in the areas you service. 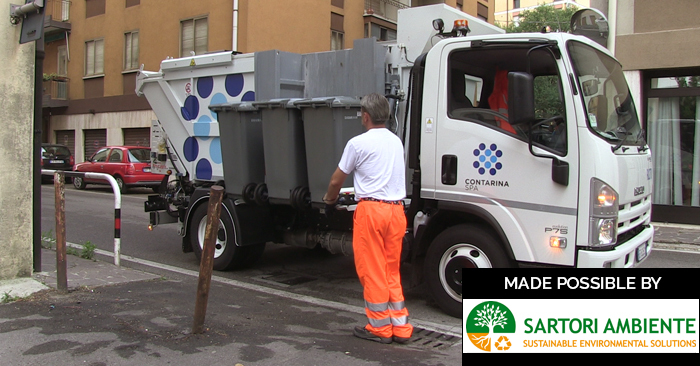 That success comes down to a lot of factors of course – maintaining a curb side collection scheme, separate collection of waste and of course the use of smart data systems as well. So to start us off and give the audience a bit more context, can you run us through the different areas you service and the types of bins that you use? 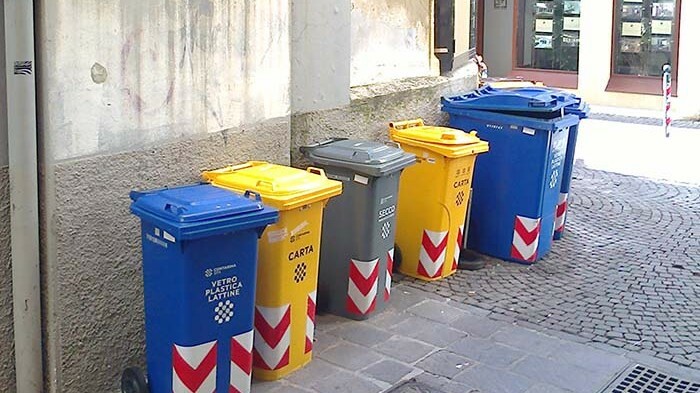 Marco Mattiello: As Contarina’s area is wide and we work on historical centers and urban centers, and also in the countryside, we can offer our users different kinds of bins. 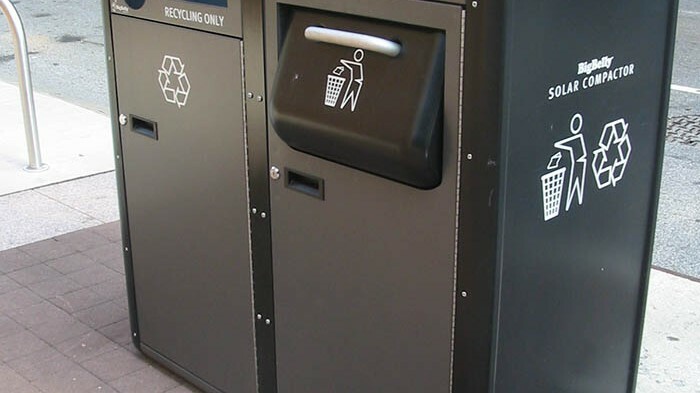 The bins we use are organic waste bins, residual waste, glass, plastic, cans, paper…and optional green bin for users that have a garden, for example. MM: It’s food waste, yes. Then the different size of bins – we have a thirty litres bin dedicated to our users and families that live in complex urban areas, so for example condos or historical centres. Then users that have a bigger house or a garden, we give them the hundred and twenty litres bin. Q: And all of these bins now feature RFID chips. How are these chips integrated in the bins, and how does it work with the scanning system? MM: The RFID chip is on the edge of the cover of each bin. Just to let you know, we’ve been using this technology for over ten years. And as you know technology runs, so while before we had to use a special scanner that has to be close to the bin each time our operator used it, now with the newest technologies we use an antenna on our lorries so we’re able to scan each bin directly from our lorries. Q: In terms of the pricing model you have for users – which is a VERY important component of a successful zero waste programme – there is a fixed fee first of all based on the number of household members, and a variable fee on top of that based on the number of residual waste pickups. You also have a discount for home composters and a fixed quota for garden waste. In order to calculate the residual waste fees, it is important for you to measure the number of pickups, and this is why tracking system is so useful. Can you tell me more about this pricing model & how it works? MM: We base our fee on the number of residual waste bin removals. We need to know exactly for each user how many times their bin has been emptied. So each operator brings the residual waste bin to be emptied. What is interesting is that as our fee is based on the number of pickups, so we don’t really care what the exact weight of each bin is. The user then brings out their bin when it’s full – there is no reason for them to bring out their bin when it’s half-full because they will pay more. Of course, when the lorry arrives at the transport station we know the weight of the lorry, but not the weight of each single bin. Q: With all this crucial information you obtain in real-time, we get a picture of the unique opportunities this can give in terms of system optimisation and increasing user participation or satisfaction. And the users can access and view their data easily via the internet. Can you tell us some more about what the user can see and how it benefits them? MM: Each user has their own username and password, where they can check in real-time how many times their residual bin has been emptied, at what time, and which day. Every family, depending of the numbers in the household, has a fixed number of pickups during the year, so they know how many times they could still empty their residual waste bin before paying more for extra pickups. Q: When talking about smart data systems, we see a lot of potential to use this collected data in new and interesting ways. 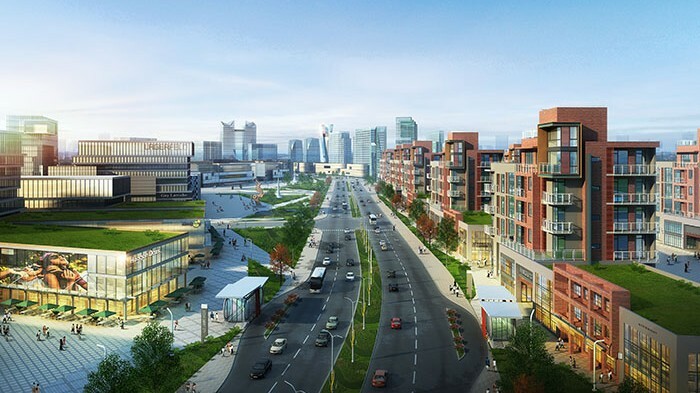 For example, well-performing households or areas can be rewarded for their good work, or be top of a leader board to create friendly competition between neighbourhoods. Contarina is known for the continuous improvement culture, which is essential for reaching zero waste. What are you developing right now with this smart data system, and what are the next steps that you’re looking at? MM: We are developing software in order to have a real-time connection between our operators, our lorries, that are on the roads everyday. We’re talking about three-hundred lorries on the roads every day. So for us, it’s very important that each operator will be able to communicate – not only with headquarters but also with his colleagues. I’ll give you an example: if there is a car accident at four in the morning when all our trucks are on the roads, the operator will be able to inform his colleagues that there is a car accident on that street, so his colleagues can change their routes instead of getting stuck in the traffic jam. Q: Looking at your data system management, how many staff members are dedicated to the IT part of the system in relation to the population you’re covering? MM: The population we’re covering is more than half a million inhabitants, and my colleagues that are working in the IT department is a dozen. Q: In relation to recycling targets and your future plans, you aim to go even further with a 96.7% recycling rate and only ten kilograms of residual waste per person by 2022! This will challenge you to find innovative solutions, and collecting and managing data would play a big part in this I imagine. 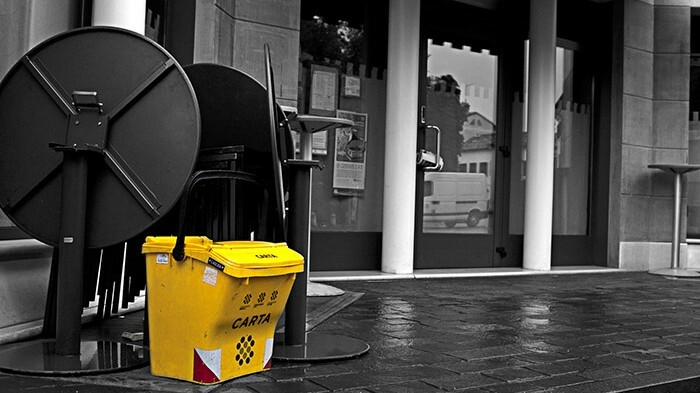 How are you planning to leverage the smart data system, or big data, to achieve zero waste? MM: Big data for us is very important – first of all for lowering contamination on our waste, and also to have a lower quantity of residual waste as our goal will be of reaching ten kilograms per inhabitant per year. And of course it’s really important for us to improve the consumption habits of our citizens and our users. Q: And finally, I’d like to just ask you about green job creation – how does this fit into your zero waste vision as a company? MM: For us it’s extremely important. We’re not just working on green jobs. Contarina, for example, are green jobs, but we are looking to create new green jobs. Especially because this financial crisis, not only in our region, in our country but unfortunately in all Europe has made a huge number of people unemployed. 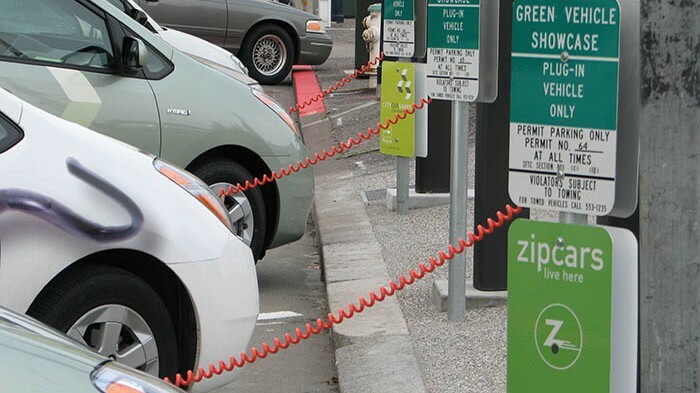 So bringing our models to new territories, we know we can create new positions and new green jobs, compared to the traditional street collection. So we are very glad to help people and provide jobs to the citizens that are not that lucky and are unemployed. The Organic Stream: And now, during our trip to Brussels, we attended the Workshop on Best Zero Waste Practices in the US and EU, organised by Zero Waste Europe on the 4th of March. 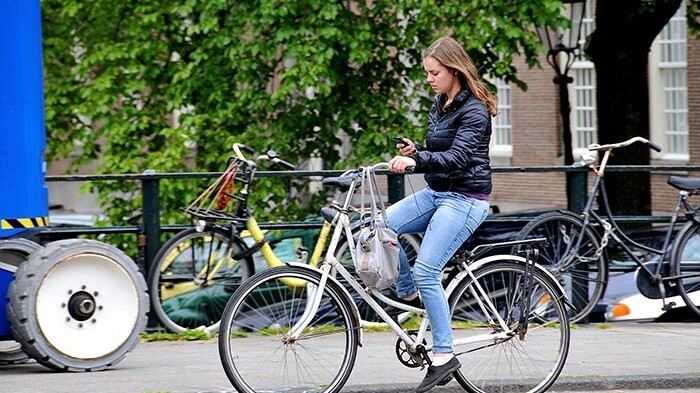 And the 2015 European Circular Economy Conference on the 5th as well, both of which were organised in the wake of the new European Commission’s decision to withdraw the waste policy package that was on the table after four years of work. The package, which was intended to increase recycling levels and tighten rules on incineration and landfill, was scrapped on January 22nd 2015, with the commission promising to come back with a package that has a wider vision and more ambition for next year. Piotr Barczak: The waste package was withdrawn and we were not happy at all with that. It showed an undemocratic way of dealing with legislation by the new commission. It was withdrawn, and at the same time it was said by the commission that it will come back more ambitious, yet there is no reason to believe that it will really more ambitious with in such a short period of time – it took the previous commission four years to come up with this one. TOS: And that was European Environmental Bureau, Piotr Barczak sharing his thoughts with us during the conference. The decision has stirred up a lot of anger and debate – some calling it a missed opportunity, others saying it’s undemocratic, and more still wondering what this will mean for the future of sustainability in Europe. Here is Kęstutis Sadauskas – Green Economy Director at the European Commission’s Environment Directorate General the Circular Economy conference giving us a little insight into current commission thinking. Kęstutis Sadauskas: We are retreating into internal reflection, and thinking about how to spread that circle – how to make it realistic but also more ambitious at the same time. Yet that retreat is not behind closed doors: what we need to do is to get back to reality, to reconnect to the real. See what facts are there, what developments are taking place on the ground – and I know that they are really vast. What technologies are coming into play and how we can use them for our vision, and also how to make it more attuned to economic instruments. I’d like to caution that probably what we need to do is to set ourselves a longer action plan, rather than just drop a whole bunch of regulations and see how things go. Some of the things will be legislative, some of the things will have to be semi-legislative, in the form of by-laws. Some of the things probably could be soft laws or even voluntary approaches. These are all open issues for us. TOS: As you can hear, there is of course not much commitment to anything specific – so it’s hard to get a sense of how exactly it will develop. So during the conference, one of the big questions on people’s minds was – just what did the commission mean by being “more ambitious?” and Kęstutis gave us a few ideas on that front. Kęstutis Sadauskas: We have to look at the other part of the circle in the circular economy, and the other part is nothing but the waste prevention. Probably this is not the easiest one, to say the least. It could be rather demanding, and by the way it could be rather controversial because what we’re talking about is how we live, and this is quite an intrusive approach Can we go that deep into this concept? 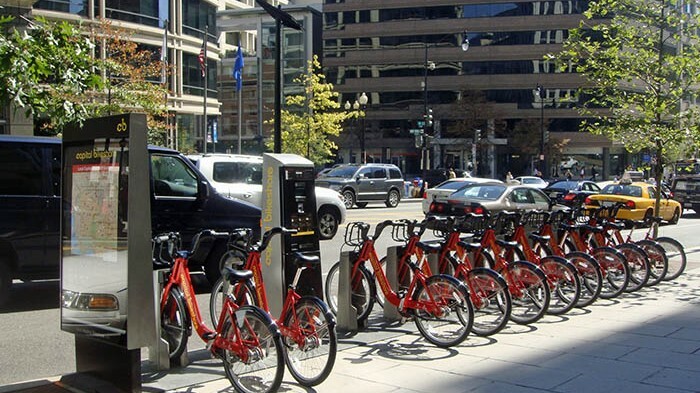 Well if we want to do the full circle of the circular economy, then we probably have to. Many, like Piotr Barczak, strongly agreed that prevention should play a bigger role, but he, among others, was adamant in stressing that the new proposal should still keep a focus on waste and recycling targets. Piotr Barczak: We should not lose the focus on waste: the proposal was the waste proposal, not the circular economy proposal. I hear a lot of roadmaps, a lot of long action plans, but I remember one from 2011 – the Roadmap for Resource Efficiency – and the waste proposal was, finally after three years, the only concrete step that was done by the commission so far, and it was withdrawn, by the reason that we have now a short break. I’m sorry, but we are not taking a short break; waste is produced all the time, and waste has to be treated. This is why the new waste proposal should remain ambitious, and the Commissioner said today that the targets will remain. TOS: What’s clear from the conference as well is that there will be a focus on business and building markets. Gary Crawford: We need to incentivise the use of secondary raw materials. And we see that there are more and more companies that would like to be able to bring in the secondary raw materials, but there’s a little bit of concern about the quality. So we need to work towards setting standards and showing that the secondary raw materials are as good – or better – than the virgin materials. So that needs to be done, but to start to prime the pump, what would be helpful is to get some incentives, and that could be perhaps reduced VAT tax for using secondary raw materials – or even on the other side, some incentives for setting up recyclable content within certain products. So I think those types of things could really help and enhance the market start up. TOS: That was Gary Crawford, Vice President of International Affairs at Veolia, giving his view on what he thought should be a driving issue moving forward. And one of the concerns, and something that we want to highlight as well, is the fact that energy recovery, or incineration, is well subsidised at the moment while resource recovery and redesign is not – or at least not to the same extent. Many are wondering if this will now change, and we asked Piotr during the conference to give us his thoughts on the matter. Piotr Barczak: Waste is a mistake of a system, and if we treat it as a resource and that is an argument for incineration? Okay let’s burn it. But that’s not true: if something is not recyclable, the better way to deal with that is to design-out this product. There is a new concept starting at the European Commission, which is an Energy Union that has in one of its communication a sentence that says we should look in more detail at waste to energy. We could say that maybe, finally, waste to energy could be clarified as a very inefficient way of dealing with resources. But on the other hand we’re worried that some lobbying powers can still ask for more incineration as a way to deal with the problem of landfills. And here they push for an idea, which is called “zero waste to landfill”, which is an exact hijack, I would say, of a zero waste campaign. So, zero waste to landfill is a wrong concept that is actually giving incentive to incineration. TOS: So we have yet to see what role energy recovery will play, and how big a role it will play, in the new package. And During the workshop, best Zero Waste practices in the US and EU, organised by Zero Waste Europe the day before, we heard similar concerns about energy recovery and the waste package withdrawal more generally. Ariadna Rodrigo: I think it is appalling that the Commission has decided to withdraw the circular economy package. It is also shocking that they say that they withdrew it to do something more ambitious, when in fact they could have actually modified the package without withdrawing it. I strongly believe that gives a very wrong signal. We are wasting time for an area where action is urgently needed – not only because of the jobs it would create, and also the environmental benefits, but also because the tax payer at the moment is paying too much for the waste to be treated. I am very concerned that despite the fact that the commission says they want to do something more ambitious, we saw last week that the commission also proposed that there is going to be a communication on energy from waste. It’s a very clear, unambitious communication. If they’re really concerned about closing the circle, and making that linear production model a circle, then incineration does not have a role for that. So I’m very sceptical that the real reason for the withdrawal of the package was to make it more ambitious. We spoke with Zero Waste Europe’s Joan Marc Simon, moderator of the workshop, about the two case studies presented and what the commission should take away from their stories. Joan Marc Simon: I think San Francisco has been very good at political leadership – when nobody else in the world dared to go for zero waste, and they had a mayor who believed in it. And without knowing what they were doing, they said “We want to go there” and how to get there came later. That is quite inspiring, and it shows that the political vision is very importing. From Contarina, it shows that with technical expertise, with the involvement of people, and consistent work, it is possible to have technical solutions for almost everything. And the fact that they are now at eighty-five percent diversion, and are aiming for ninety-six percent – it shows that they actually have the technical capacity to get there. This technical expertise from Contarina, with door-to-door collection and pay-as-you-throw, and now looking into residuals – it’s something to take home. TOS: Representing San Francisco at the workshop was Jack Macy – Zero Waste Coordinator at the City and County of San Francisco Department of SF Environment. And as we heard from Joan Marc Simon, San Francisco was unique in how it just went straight for zero waste and learned along the way. Jack Macy drove home this point to us when we spoke with him, and was very clear about how important a zero waste goal was to building a circular economy. Jack Macy: Zero waste is an important vision, and the value of setting a zero waste goal is to say that we want to keep striving to become more and more sustainable, and utilise all materials – seeing the inherent value of the embedded resources and energy in materials. It’s the same with the circular economy – it’s just another way of looking at it. Essentially, we have an unsustainable linear system and we need to move to a circular economy for conservation of resources, for protecting our environment, and for other social and economic benefit. So equating the circular economy with zero waste is really important, but I would not let perfection be the enemy of the good. And if you wait to have the most comprehensive policy where you address all potential questions, you can just keep delaying and delaying. So, for example, there’s a real value in setting a goal for zero waste and setting a zero waste policy even if you haven’t figured out how you’re going to ultimately get to zero waste – or whether it’s even possible to get to zero. It may not be possible now to get to zero, but if we always have that as a goal, we keep striving to look at all the decisions we make and question how it helps us lead towards zero. I think it’s important to create a policy framework to steer us towards the circular economy where we don’t have to have every single step of the way figured out, because you can keep raising questions and concerns and saying we need more research – and that just becomes a delay tactic. And until you put forth that vision, people can say, “Well, we’re not on the same page with that, so I’m going to go ahead and invest in incineration”, which is inherently a linear economy component and works against the circular economy. But if we have a circular economy policy or vision, without every little piece being addressed, we have a map to say that investing more into incineration does not fit into that. So my recommendation for the EU is that there be a strong package setting very ambitious goals, so that everybody is on a level playing field moving together with the impetus of that policy, and not leaving it just to an uneven market place that doesn’t factor in the real cost or internalise all the externalities that we have. So, we cannot rely on the market place – we need to have government set strong and important policy and set clear roles, and that can help channel proper investment. TOS: Great points there from Jack Macy. Well as you can hear from our briefing, a lot of valuable knowledge and experiences were shared in Brussels last month, and there is much for the commission to take in and digest. We have yet to see how this will play out, and indeed while there is hope for the new package – that it will be more ambitious and go further than before – there is quite a bit of scepticism too. 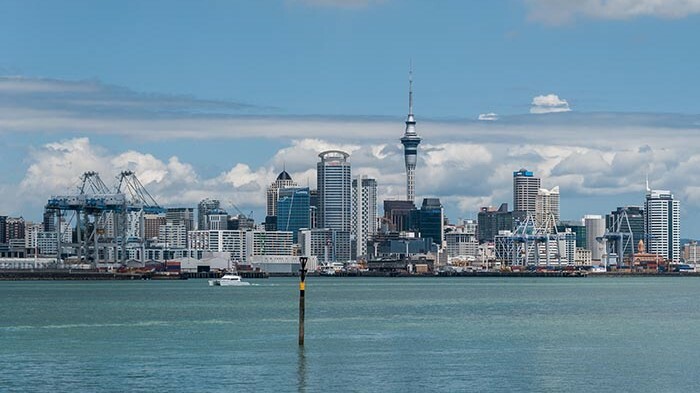 It would be a perfect opportunity to bring in stronger waste targets and promote the waste hierarchy – with a greater emphasis on reuse and redesign – but we have to wait and see.